To honor and reward outstanding K-12 educators for the quality of their teaching, their professional leadership, their engagement with families and the community, and their potential for even greater contribution to the healthy development of children. To focus public attention on the importance of excellent educators. To encourage able, caring and creative people to choose the challenge, service and adventure of teaching as a career and to rally support for dramatic improvements in the motivation and achievement of students. To advance education technology as a means to improve the performance of students, enhance the effectiveness of educators and strengthen the engagements of parents and the community. To create national and state networks of Milken Educators that: foster the active professional development and career enhancement of Milken Educators and other professionals, encourage Milken Educators to help shape the educational policies that influence their classrooms and schools, connect Milken Educators with the educational improvement efforts of state education agencies, universities, corporate partners and other allies. To engage corporate and foundation partners in support of Milken Educators and in advocacy of policies that advance education. Innovation and Management: Has created new programs or revitalized existing programs, gets things done, rises above the ordinary. Communications: Uses speaking skills to inspire and influence others, and relates current literature to teaching and content. Motivation: Induces active student involvement, creates a learning environment, demonstrates exceptional ability to challenge students to achieve their highest potential. Leadership: Is involved in development and implementation of inservice training programs for teachers and other educational personnel. 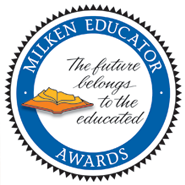 Visit the National Milken Educator Awards page for more information.